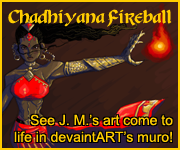 Read Chadhiyana creator, J. M. DeSantis's recent interview with SequentialTart.com! Chadhiyana and all related properties are the ™ trademark and © copyright of J. M. DeSantis. All rights reserved. 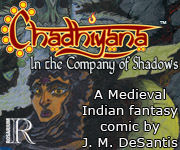 The Chadhiyana logo was created by Corey Breen.